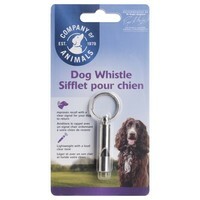 Company of Animals Dog Whistle is a good all-round whistle. It is perfect for the pet dog owner and professional alike. The Company of Animals Dog Whistle is made from tough steel, yet a lightweight design providing a clear, strong whistle. We thought this was a good whistle, our dog responds to the noise well, nice and small to keep in your pocket when you go walking. Not a very good whistle. It doesn't produce a very good sound.